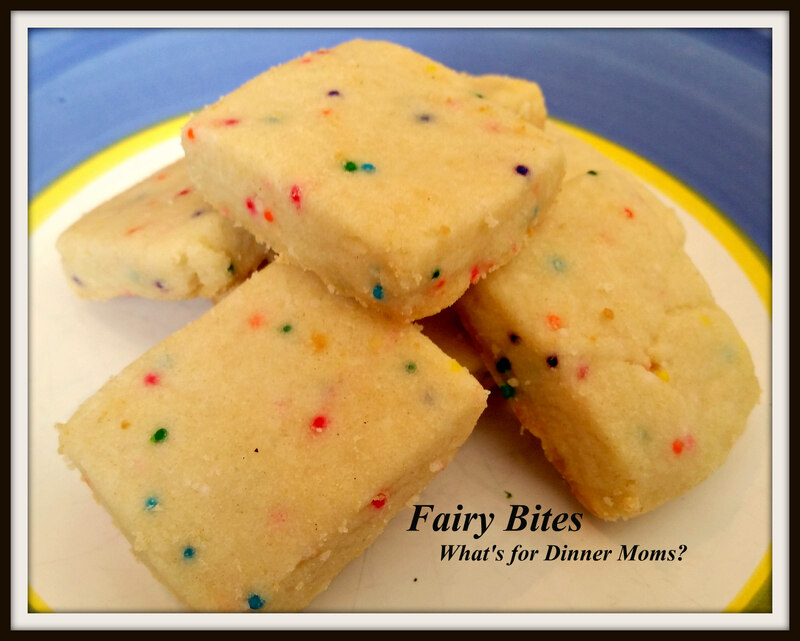 Fairy Bites – What's for Dinner Moms? It was a busy weekend for us. My son had Science Olympiad practice both Saturday and Sunday and my daughter had the Girl Scout International Bazaar to get ready for on Friday and the Bazaar on Saturday. One of the things the girls go is sell items, for under $1, that are representative of the country that they have chosen. My daughter’s troop was New Zealand. They are to have a couple food samples, representative of the country, and a few crafts for sale. One of the food items they chose was Short Bread. To make it more appealing to little girls they made “Fairy Bites” with this recipe from Land O’Lakes. These would be cute for a little girls tea party or Tinkerbell party. We have already started brainstorming about different color combinations for the holidays! I feel a red, white and blue dessert for 4th of July! These are addicting! Seriously, I could sit and eat an entire pan by myself. They are cute and tiny and you don’t feel like you are eating much but the amount of sugar and butter? It is definitely not a health food. But, as a treat they were yummy! Preheat oven to 325 degrees. Line an 8×8 baking pan with parchment paper. Let the paper over hang the edges so you can lift the cookies out after baking. Combine the butter, sugar and almond extract in a bowl beating at medium speed until mixture is light and fluffy. Reduce beater speed to low and add in flour and salt mixing until well combined. Stir in nonpareils. If dough is crumbly knead in bowl just until a ball forms. Place the dough into the square pan and spread evenly. Lift the unbaked cookie dough out of the pan and place on a cutting board. Using a pizza cutter cut the dough into 1/2″ squares. Place the squares on an ungreased cookie sheet and bake until the bottoms just start to turn golden, approximately 15 minutes. They were! I have been cutting down on sugar and it tasted SOOOO good! My kids are my life right now. I only have them a few more years and then they will be off to college. Trying to pack all the fun in we can now!